The prime purpose of collecting your data is to provide you with services (“Services”) offered by our website (“Site”), whether that’s using our Site to read articles, find information, to contact a professional, to advertise your business, or for some other reason. No matter how you use our Site, our aim is to allow you to interact with it as effortlessly as possible. Please be aware that our Site and Services may contain links to third party websites that are not covered by this Privacy Notice. With that in mind, we ask you to review the privacy statements of other websites and applications, and/or to request this information, to make sure you understand their information practices. We’re registered in the United Kingdom under company number 05489185, and our registered office and main trading address is situated at Building 3, Riverside Way, Camberley, Surrey GU15 3YL. Our Data Compliance Manager is Steve White, and they can be contacted at privacy@happiful.com. Information you give us. We collect information you voluntarily provide to us by filling in forms on our Site happiful.com (our "Site"), by corresponding with us by phone, e-mail, live-chat services, or in other ways. The information you give us may include your name, address, e-mail address and phone number. Where we take any financial payments from you, these will be done securely and in accordance with industry standards. information about your visit, including the full Uniform Resource Locators (URL) clickstream to, through and from our Site (including date and time); pages you viewed or searched for; page response times, download errors, length of visits to certain pages, page interaction information (such as scrolling, clicks, and mouse-overs), and methods used to browse away from the page and any phone number used to call our customer services number. Information we receive from other sources. We may receive information about you if you use any of the other websites we operate or the other services we provide - for example, if you subscribe to Happiful.com or use the Happiful mobile app, we may receive information about related Counselling Directory content that you’ve viewed. b) processing is necessary for the performance of a contract to which you are a party, or in order to take steps at the request of you prior to entering into a contract - for example, if you purchase a subscription to our magazine. In some cases, the collection of personal data may be a statutory or contractual requirement, and we will be limited in the services we can provide you if you don’t provide your personal data - for example, if you do not provide us with your personal data, you will not be able to apply for a digital subscription to our magazine. We will let you know how this will affect you at the time. 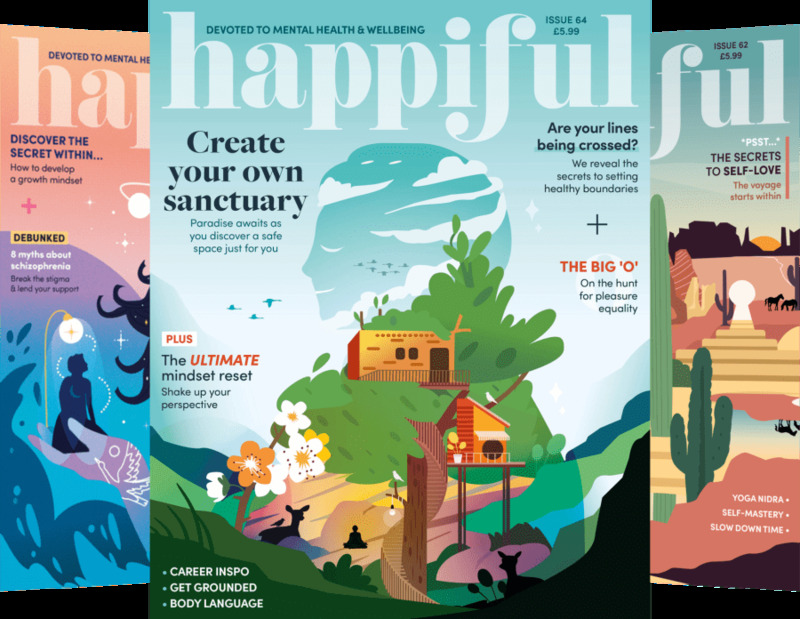 If you wish to sign up to receive our Happiful magazine (either the free e-magazine or paid printed version), we will use your details to communicate with you when a new magazine is released, and to keep you informed about other news and services that may be of interest to you. We won't pass your details on to any third parties other than where necessary for the delivery of the magazine. We will give you the option to adjust your email preferences or to unsubscribe. We may also store information about you, such as your IP address or website activity, in certain database fields to record certain actions - for example, if you subscribe to our e-magazine, purchase a print copy, register for our services, or interact with our site in other ways, we use Google Analytics and Facebook Pixel to record that you’ve successfully completed a specific action. We use this information to monitor and administer our site (such as evaluating the effectiveness of our advertising methods). Generally we do not rely on consent as a legal basis for processing your personal data other than in relation to our marketing communications or sending third party direct marketing communications to you via email or text message. If you don’t want us to use your personal data for any of the other reasons set out in this section, you can let us know at any time by contacting us at privacy@happiful.com and we will delete your data from our systems. However, you acknowledge this will limit our ability to provide the best possible service to you, and some parts of our service may not be accessible to you as a result. We only share the appropriate level of personal data to enable the supplier to provide their services. Where your data is required to be shared we will take all reasonable steps to ensure it is handled safely and securely and in accordance with our and the suppliers’ obligations under GDPR and the law. For questions about third-party vendors, please send an email to privacy@hapiful.com. All personal information we retain will be subject to this Privacy Notice and our internal retention guidelines. We will also retain data in an anonymous form for statistical and analytical purposes, for example, to understand how our users interact with our service. If you have a question about a specific retention period for certain types of personal information we process about you, please send an email to privacy@happiful.com. You can ask us not to use your data for marketing. If you are a member of our Site, you can do this by updating the relevant settings in your Members’ Area, or by contacting us at any time at privacy@happiful.com. For all other enquiries of this nature, please contact us at privacy@happiful.com. We rely on you to ensure that your personal information is complete, accurate and up to date. Please do inform us promptly of any changes to or inaccuracies in your personal information by contacting privacy@happiful.com We will respond to your request as soon as possible, but certainly within 30 days. Our Data Compliance Manager is in charge of answering questions about this privacy notice or your requests to exercise your rights which are set out below. The Data Compliance Manager may be contacted at Memiah Limited, Building 3, Riverside Way, Camberley, Surrey GU15 3YL, or via email at privacy@happiful.com. Our Data Compliance Manager may work in conjunction with our Customer Service/Membership Services team when corresponding with you. In other cases, if we stop using your personal information, we will not be able to provide services to you, such as administering your sunscription.